Did you miss Part 1? Catch up by clicking here. HUECU offers a free home buying Workshop on Saturday, April 8th. Spaces are limited. Learn more by clicking here. The right realtor will be familiar with your area and can help you set realistic expectations about what’s available in your price range. They should also connect you to experts who can assist with insurance, home inspection, and other new home necessities. When considering what you want in your first home, start by thinking about the neighborhood. Do you want nearby schools or vibrant nightlife? Ample parking space, or convenient access to public transportation? Whatever your needs, your realtor should have in-depth knowledge about the safety, attractiveness and amenities of different neighborhoods, so ask plenty of questions. As you search, keep in mind the things you can change and those you can’t. An overgrown garden can be easily and inexpensively rebuilt, whereas foundation cracks will be more difficult to fix. And of course, location is one quality you can’t change. Take it all into account when making your final decision. Before you make an offer, take another look at all the numbers. Review your initial budget and re-evaluate what you’ll be paying each month if you purchase this home. Has anything changed about your financial situation that makes you want to rethink your budget, such as becoming pregnant or getting a demotion at work? It’s also a good idea to look carefully at the additional costs associated with the property, such as repair and appliance costs, moving expenses, and any extra overheads such as homeowner association fees. You can even request to see the home’s utility bills from the past year, just to check that you’re accurately estimating the monthly cost of owning this home. When you’re sure that the home is right, your realtor will help you make the right offer, and negotiate it as needed. Your offer has been accepted – congratulations! Now it’s time to finalize the process of purchasing your first home. Start by splurging for an inspection. Although it can cost a few hundred dollars, a home inspection gives you the chance to renegotiate your initial offer, or ask the seller to make pre-sale repairs if any major flaws are discovered. Once all the paperwork has been completed, your loan has been funded and the seller has a check in hand, you are ready to move in! 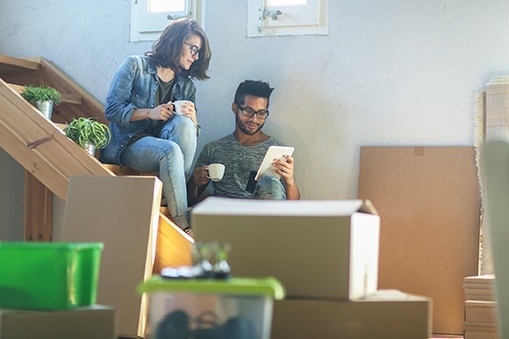 If you’re working with a first time home buyers assistance program, they may be able to help you find a good moving service and ensure your belongings arrive safely at your new home. Buying your first home is one of the biggest and most exciting purchases you’ll ever make. Luckily, the process doesn’t have to be difficult. Simply go through each step in turn, and you’ll be on your way to your first home in no time.